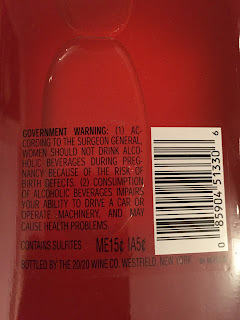 Can you believe it has been over a year since a flavor of MD 20/20 was named the bumwinebob.com Bum Wine Of The Week? During that time we have seen a variety of different beverages featured on the site, but today we finally go back to our roots! 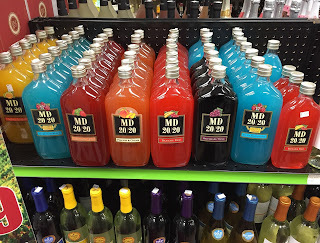 There is a wide selection of MD 20/20 or "Mad Dog" as it likes to be called out on the shelves these days and one can waste a whole afternoon trying to make a decision about what flavor to enjoy on a given night. 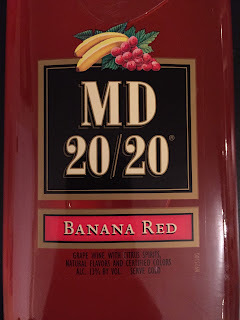 Today with the help of our new friend Kevin M. Thomas, we are going to make the decision a little easier for you as we name MD 20/20 Banana Red as the BWB Bum Wine Of The Week! A few years ago while on a search trying to find a bottle of Night Train Express, I came across some bottles of MD 20/20 sitting on the bottom shelf at one of the fine local liquor stores. 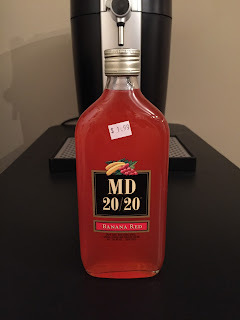 I had heard about MD 20/20 in passing and knew of it as one of the many "bum wines", but had never had the opportunity to give it a try myself. I ended up picking up a bottle of banana red and also a bottle of strawberry kiwi for later and was on my way. Upon giving it a taste, I have to say it tastes similar to one of those Tropicana Breezer fruit drinks. You can taste a strong banana flavor and only a slight hint of a cardboard aftertaste. Where is the red though? 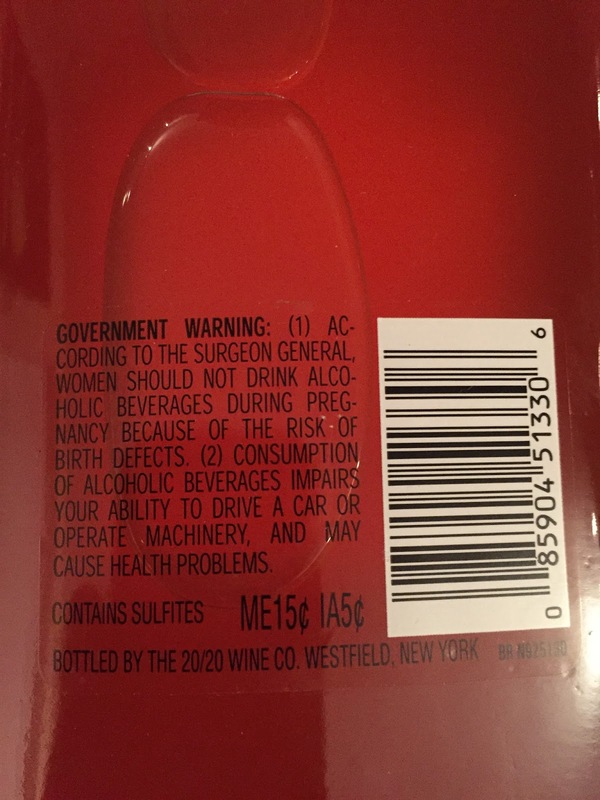 At my local liquor store you can pick up a 375ml bottle of MD 20/20 for $1.99 and a 750ml bottle for only $3.89. You cannot beat that value for the price in my book! Banana Red comes in at 13% ALC. BY VOL and is classified as a grape wine with citrus spirits with natural flavor and certified colors. What exactly are certified colors anyway? Mad Dog 20/20 has taken on a life of it's own over the years. It is usually one of the first drinks that comes to mind when talking about cheap wines and can be seen in many places. It has even become the focus of a song by our friend Kevin M. Thomas! I couldn't have said it any better myself! I am happy to induct MD 20/20 Banana Red as the BWB Bum Wine Of The Week! I will be happy to welcome Kevin to the Bumming with Bobcat podcast this Sunday LIVE at 11AM ET! We will be talking about Kevin's love of MD 20/20, the music business, drinking stories, and much MORE! What more could you ask for? Tune in and tell your friends to do the same! Cheers! *UPDATE 11/13* Due to an overwhelming demand, MD 20/20 Banana Red is staying on as Bum Wine Of The Week for a second week in a row! Tune in LIVE this Sunday 11/15 at 11AM ET as we get your ready for the holidays on the BWB Podcast! Cheers!